We had the farewell party for Sakata-kun, Ochiai-kun and Li-kun. Sakata-kun gets a position at the Waseda University in Tokyo, Ochiai-kun will start his job in a private sector, Li-kun will go back to his university after the international exchange program. 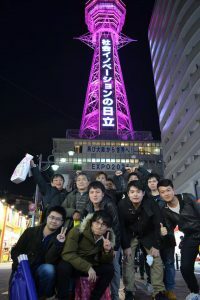 We enjoyed the Osaka-style comedy and foods. We wish you all the best in this new chapter of your life.